Tips to help you think differently and beat the chaos. You probably know by now that chaotic ways of working can prevent teams from working efficiently and achieving their goals. 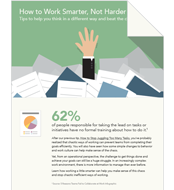 However, working smarter is easier said than done, and it’s easy for project teams to get stuck in a rut of bad working practices. Luckily, we have a few tips and tricks that can help you streamline your working processes and get work done today. This guide will help you to create a planning hub, manage your team’s workloads and set clear goals from the get go.